A new ion chromatographic method with unique separation selectivity and ultra-high sensitivity for the separation and detection of inorganic anions was developed. The method uses a conventional reversed-phase ODS stationary phase modified with a zwitterionic surfactant and an aqueous solution containing a small amount of electrolyte as the eluent. The elution order for the anions differed from that achieved by conventional anion-exchange, with for example, sulfate being eluted before chloride, and in contrast to the situation when water was used as mobile phase, only a single peak was observed for each analyte anion. Addition of the electrolyte to a water mobile phase resulted in an initial large increase in analyte retention times, but further increases in electrolyte concentration in the mobile phase produced only minor changes in retention time. Use of bicarbonate as the electrolyte anion permitted a suppressor to be used with conductometric detection. The ability to directly analyse samples of high ionic strength permitted the method to be applied to the determination of iodide in saline solution using direct UV absorbance detection, with a detection limit of 0.7 ppb. 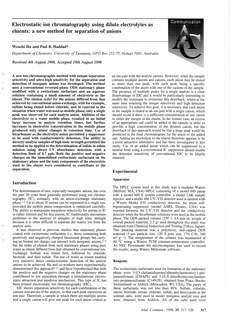 Both the positive and negative charges on the immobilised zwitterionic surfactant on the stationary phase and the ionic components of the electrolyte used in the eluent were considered to contribute to the separation.